The solar radio emission in meter-decameter wavelengths demonstrates a plentiful variety of solar radio bursts of different types (with branching to sub-types) as well as events not belonging to any specific type (Melnik et al. 2005). The last group includes variable solar emissions that result from radiation processes affected by propagation effects in the terrestrial ionosphere. Particularly, low-frequency solar radiation passing through the ionosphere could be subject to different influences such as reflection, scattering, and absorption along with refraction. The latter, in addition to causing a regular positional dispersion of solar radio sources proportional to the inverse square of the frequency, may also involve focusing and defocusing of solar radiation (Meyer-Vernet et al. 1981). Evidently, the natural focusing of radio waves from the Sun by the Earth’s ionosphere represents one specific aspect of the solar-terrestrial relationship. In the paper we present an in-depth study about spectral perturbations appearing in solar dynamic spectra and being manifestations of the focusing effect of low-frequency solar emission by the Earth’s ionosphere. Such perturbations, known as Spectral Caustics (SCs), are considered to be the result of the refraction of radio waves by medium scale traveling ionospheric disturbances (MSTIDs). The latter are identified as moving wave-like structures of electron density with horizontal wavelengths of 100-600 km, temporal periods from about 15 min to 1 h, and horizontal velocities below 250 m/s (Hunsucker 1982). The alternating depletions and repletions of electron density of MSTIDs exist in a layer of about 50-100 km thickness at ionospheric heights (250-300 km). A motion, parallel to the earth surface, of such plasma irregularities in the ionosphere results in significant changes in the ionospheric refractive index, which is the basic cause of the solar radiation focusing and defocusing effects by MSTIDs. Using the Nançay Decametric Array (NDA) data set, we have conducted a statistical analysis of the SCs in solar dynamic spectra within 10-80 MHz. The SCs have been detected confidently in the NDA dynamic spectra for 129 observational days from 1999 till 2015 inclusive. Figure 1 displays the NDA dynamic spectra comprising the most frequent formations of the SCs which are taken from broad SCs collection. 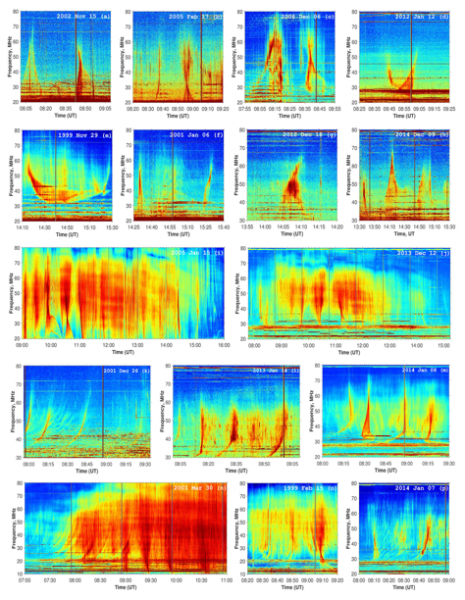 On spectrograms they appear as intensity variations different from well-known solar radio bursts. The sharp edges with enhanced intensity are distinctive characteristics of the structures for most events. Firstly, we have classified the SCs observed by the NDA as several types, based on their spectral morphology, namely: inverted V like, V like, X like, fiber like, and fringe like (see Figure 1). Figure 1. Solar dynamic spectra of the NDA with different SC types: (a, c-i) Inverted V-like; (j, n) V-like; (b, c, i) X-like; (j-m) Fiber-like; (n-p) Fringe-like. Note that some dynamic spectra include multiple SCs belonging to separate types (see detailed description in the paper). We have carried out the statistical analysis of the SCs in solar dynamic spectra during a 17-year period (1999-2015). This period partly covers the 23rd and 24th solar cycles. We found that about 81% of all days with detected SCs fall on active phases of solar cycles 23 (48% in 1999-2003) and 24 (33% in 2012-2015), respectively (see Figure 2 (left panel)). Only about 18% of days with the SCs were recorded in the solar cycle minimum phase (2005-2010). This result clearly indicates that the appearance of the SCs in dynamic spectra depends on the phase of the solar cycle. This is explained in terms of variations of the occurrence rate of strong solar events along a solar cycle that results in a corresponding change in the occurrence rate of solar radio bursts, which accompany the SCs in most cases. Figure 2. Left: distribution of days with detected SCs vs. years superimposed by solar cycles sunspot number (red color) and 10.7 cm solar radio flux (blue color) progressions. Right: seasonal appearances of the SCs in solar radio records found from the NDA observations for a 17-year period. The squares indicate number of days in a month in which SCs were detected on the NDA dynamic spectra. The quantity of SCs days from the lowest to the highest is marked by color from black to white, respectively. On the basis of the statistical examination of the SCs, we also establish the seasonal dependence in their occurrence (see Figure 2 (right panel)). It was found that about 95% of days with SCs belong to autumn-winter months, whereas only near 5% of days with SCs belong to spring-summer months. Since the SCs are believed to be caused by MSTIDs, this seasonal dependence can be related to the similar dependence in the appearance of MSTIDs. In fact, such variations of seasonal occurrence rate of MSTIDs have been confirmed in several studies (e.g., Otsuka et al. 2013). Thus, the current study presents strong evidence for a direct connection between MSTIDs and SCs with a quantitative analysis. Structures such as Spectral Caustics reveal an effect of natural focusing of solar radiation by the Earth’s ionosphere. In this paper, we present some novel findings relating to the SC research. For the first time, an extensive review of SCs, appearing in solar radio records, has been performed. It was found that the appearance of the SCs in dynamic spectra demonstrates the solar cycle and seasonal dependences in the occurrence of the SCs. Also, SCs were categorized on separate types, based on their distinctive spectral features. This classification may be helpful for identification of unknown patterns in the solar dynamic spectra.